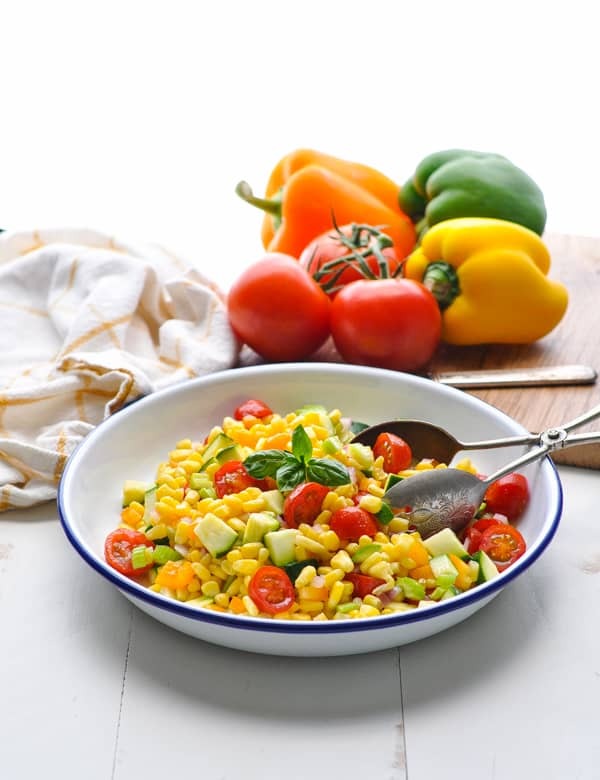 A rainbow of fresh vegetables come together in a crisp, sweet and simple Summer Corn Salad. 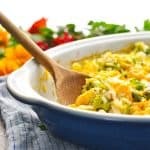 This healthy and delicious side dish is the perfect addition to your next family dinner, potluck, or cookout with friends! Heads up! 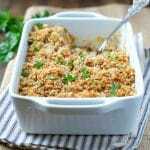 This recipe was originally published in June, 2015. The photos were updated in June, 2018. 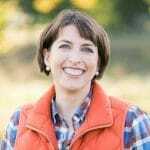 As the name of my blog suggests, I love to take inspiration from the changing seasons and create fast and easy recipes that my family loves. 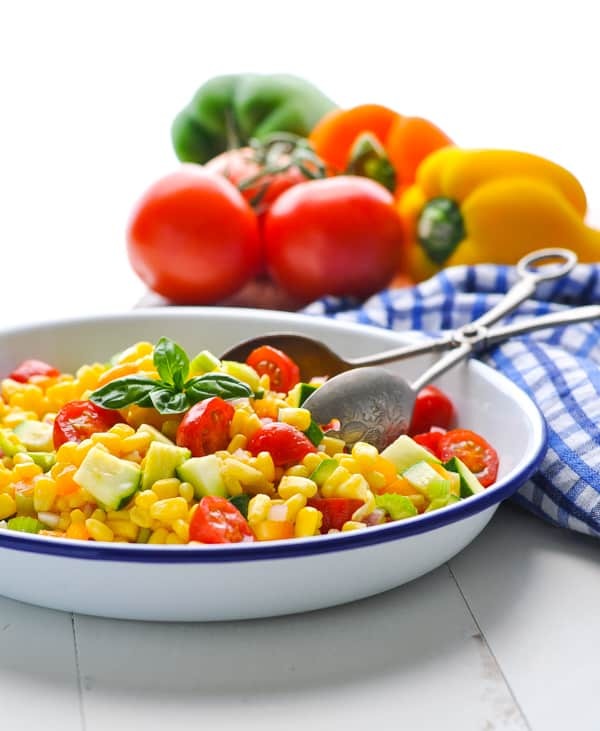 In my mind, nothing says “summer” quite like a fresh corn salad! 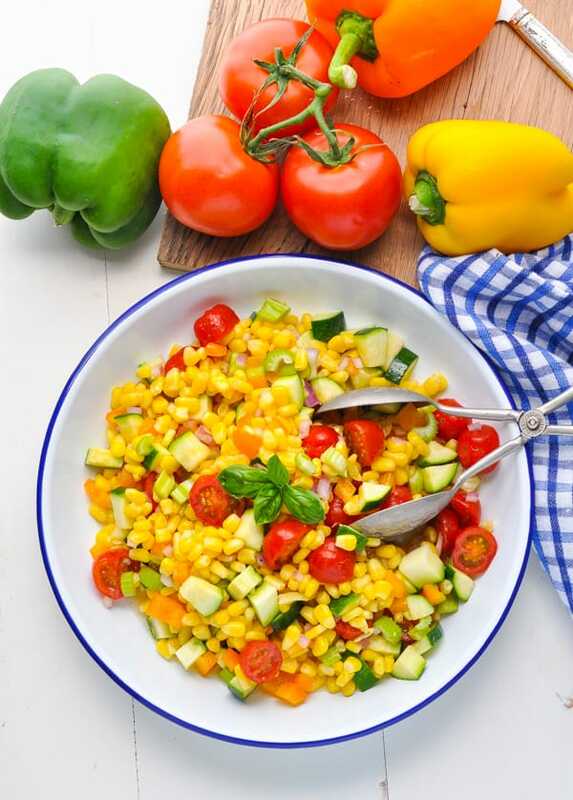 By combining some other less familiar veggies like zucchini and celery with the corn in a vibrant, colorful salad, the kids cleaned their plates without even a sideways glance. We also spent a few minutes talking about the rainbow of colors in this dish, and trying to identify each different veggie that was sprinkled throughout the salad. 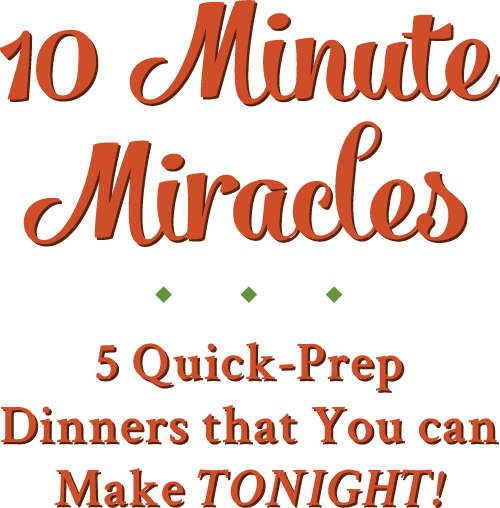 It’s a quick and easy way to make healthy eating fun, while taking the pressure off of Mom at mealtime! 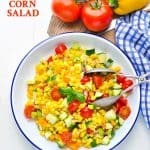 Want to make your own easy corn salad recipe? Don’t want to make your own dressing? Toss the vegetables with your favorite store-bought salad dressing. A light vinaigrette is perfect! 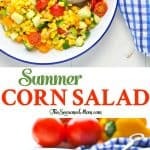 If you’ve tried this Summer Corn Salad or any other recipe on The Seasoned Mom, then don’t forget to rate the recipe and leave me a comment below! You can also follow me on Facebook, Twitter, Instagram and Pinterest to see what I’m getting up to. 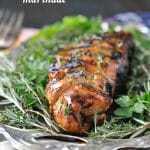 This is a great make ahead side dish for a summer picnic or potluck! It keeps well in the refrigerator for at least 2-3 days. This look like the ultimate salad, Blair! I can’t get enough of fresh corn in the summer, so I’m loving this. 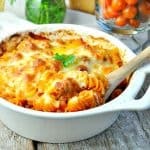 Such a great idea to add in zucchini and tomatoes, too. Sounds so fresh and delicious! Pinned! 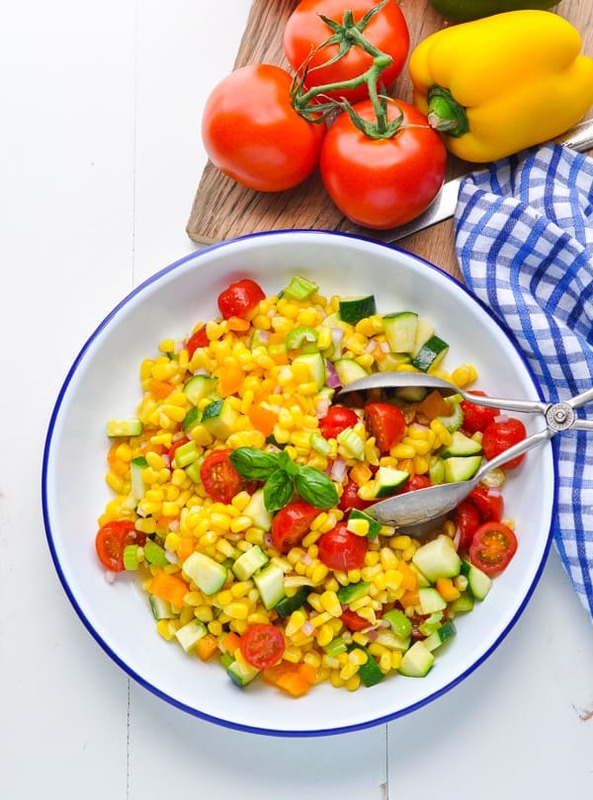 This summery salad is so colorful and inviting! Fresh corn is a real treat in the summer. Love this a hundred times over! That salad looks delicious Blair – my kids would love it! 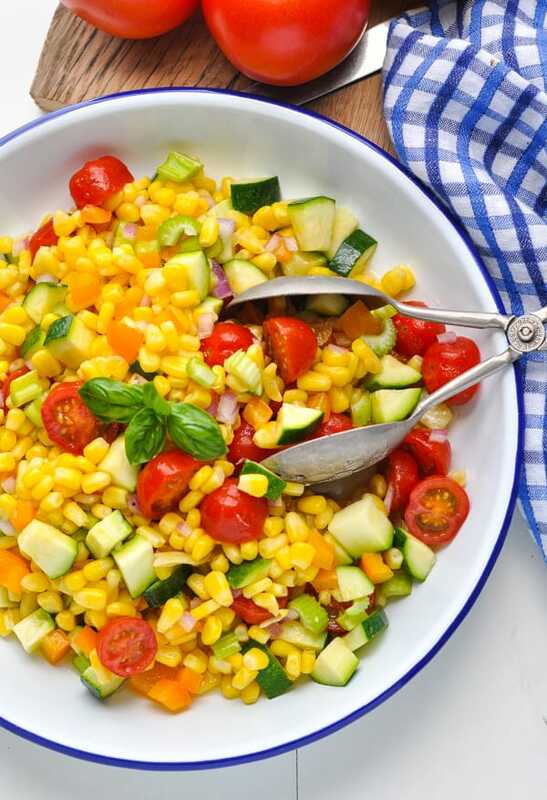 Corn is always a winner in the summer! 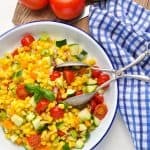 not only will kids eat this because of the love of corn, but that color! look at it! so inviting and nourishing. YUM! So true, Lindsay! The rainbow of colors is so appealing to little ones! 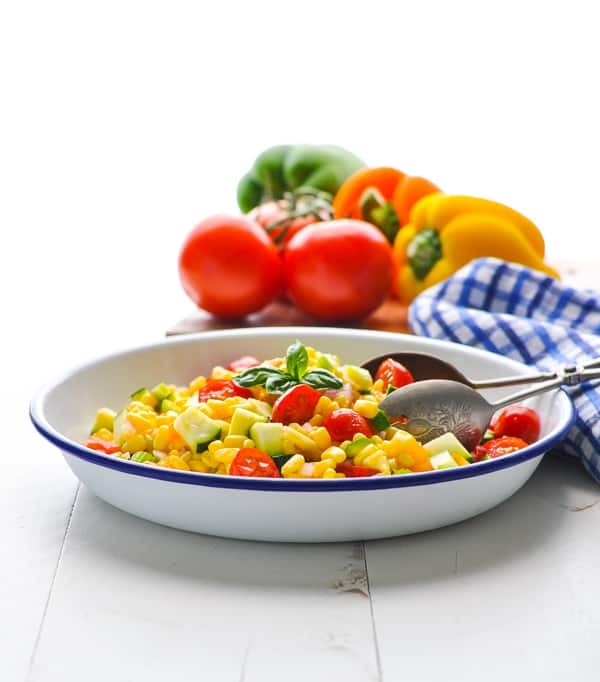 This is probably the perfect salad for the summer. The zucchini blends much better than I expected with the rest of the veggies. I am sure that this salad will become a weekly regular by the end of the summer.